Yesterday was an exciting day for the Shadowhunter Chronicles fans because the actors who will be playing Isabelle Lightwood and Simon Lewis in ABC Family’s Shadowhunters were announced. 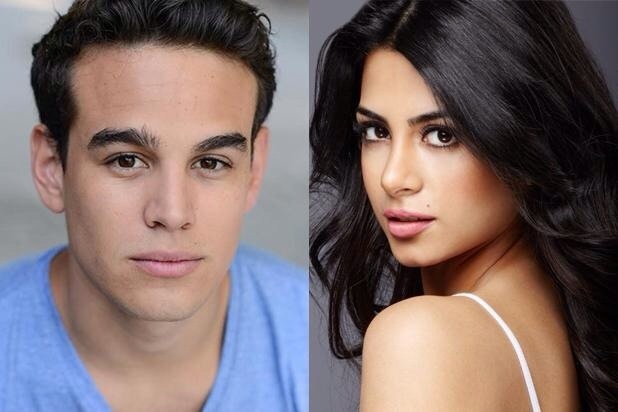 Emeraude Toubia is our Isabelle and Alberto Rosende is portraying our Simon. Reactions to their castings were mixed, to put it mildly, so Cassandra Clare took to her social media pages to let fans know her thoughts. Any roles at all, even if the characters were white, and I said "Yes. Please do. Go ahead." I love the actors they've cast so far. I'm delighted we have a diverse cast. They are gorgeous and talented. they were not the white choices. I'm excited about how great they are, and I think you will love them, too. Even those who are fearful now. @EmeraudeToubia we are so happy to have you for our Izzy. @arosende We're so happy to have you! I loved your audition. I’ve seen their auditions. They were both terrific. Emeraude is beautiful and sweet and tough. Alberto is charming and nerdy and adorkable. maggzee said: People are making racist remarks about the Hispanic actors portraying Simon and Isabelle in the TV series. How do you feel about the casting? I am really happy about the casting. I said this on twitter and I will say it here. The producers and network did approach me about how I would feel about “colorblind” casting — casting the best actors and actresses they could find, regardless of race. There were some actors and actresses of color that they were especially excited about looking into and they wanted to know if that would be an issue. I said it wasn’t an issue for me. That I supported the idea, they’d have my unconditional backing, I would love to see diversity in the cast. That while the characters who are characters of color in the book (Magnus, Maia, Raphael) must remain as characters of color, and be cast that way, I had no such feelings about characters who were white or white-assumed. The actress cast for Izzy is fierce and fabulous. If she can represent for Latina and Hispanic girls, all the better. The actor cast for Simon is adorable. If he can represent for Latino and Hispanic boys, terrific. Many have asked if this affects Simon being Jewish: it does not. He is still Jewish. There are plenty of brown-skinned Jews. Quite a bit of my own family, in fact. I don’t know how this will affect the casting of Alec. I hope they will pick the best actor, and they have shown this does not necessarily mean a white actor. I also do not know whether S&I will be Latin* in the show, whether that will be written in as part of their characters. I simply don’t know. If you have a problem with POC being cast in these roles, well, you’ll have to take it up elsewhere. I am for it. I told the network that my fandom would be supportive; that they were diverse and awesome. I want you to live up to my description of you. Most of you already are. I believe the rest of you will. Please keep comments respectful. All hateful comments will be deleted. where i do think it’s important to be supportive and wait for the acting before you judge them. The whole “If you don’t like them, you are a rasist” thing is not making me like the fandom at the moment. Cassandra basically saying the same doesn’t help open up the dialogue that should be had, instead of the judgement that is currently being applied. It just going to become a bigger problem the more cast members are announced if it isn’t dealt with properly. That being said, Good luck to them both and I really hope they are as talented as cassandra claims them to be. Off topic but I love your username. BTVs was one of the best tvshow in the world and I’ve never seen a show that even came close to the brilliance that was buffy the vampire slayer. Every YA fantasy show has that same opporunity but they never quite get there. I’ve stopped watching them all at some point. Maybe shadowhunters can give it a shot..
Bookmarking this post. Next time I see complaining I’ll just direct people here. Love this cast so far and totally dig their enthusiasm. Let’s show everyone how awesome and CLASSY we can be. Can’t wait to see who plays Magnus, Alex, and Clary. Honestly, why do people care about the race/ethnicity of the people cast in roles where it doesn’t matter? Can we please just wait to judge them until we see them act? no problem hun, you are welcome…just had the need to say it….I’m from Uruguay, totally hispanic, even though with Portuguese and Spanish ancestors, my whole family on my mom’s side is black and I’m white, like really white, lol, and when I visited the US they actually thought I was an American, so….how we looks it doesn’t determine where we are from, and Isabelle and Alec’s great mother’s last name was Monteverde, which is an Spanish lastname….so she had hispanic blood…. I really don’t see a big difference between a Latin actress and a “white” actress. Maybe because I’m from Chile, I would be a Latin in the United States, but I am white!… There’s so many variations of colors in Latin America, and you would be very surprised if you see a group of Argentinian girls… They have a lot of Italian ancestors, so many of them are white and blond… Here in Chile, we are kind of a mix between Hispanic people, and the mapuche, but I know that I have germanium and French ancestors too… There are at least 4 Chilean actors that have been successful in the United States, Cristián de la Fuente (who is used for Latin roles because he looks like one, and he has worked in CSI), Leonor Varela who made the role of Cleopatra in a Hollywood movie (she is a little exotic), and I don’t know the names of the other two, but one is the Jewish woman in NCIS, and the other one is the fat guy in Lost, who represents a typical North American guy… The last two have many years living in the United States, so many years that they feel that country as a home… So what if Simon and Izzy are played by Latin people? I feel very very happy for them, and I trust that they were chosen because of their talent and professionalism. Just remember that people from the whole world are mostly a mixture of races, and we really don’t know how pure our race is, no one can be really sure. Honestly I don’t care that the actors for Simon and Izzy are Latin. But it’s funny that Classanda Clare says she doesn’t either as she said when the movie was released that it was very important for her that the producers had respected the races of her characters. It was about Magnus if I remember correctly (and yet the actor was Chinese and not Indonesian). I think what she meant is that it’s not a big deal for the “white” characters because there are hundreds of different color types, including hispanic….but other characters need to be cast based on their race because they race is part of their own personality and how they see the world, the poc in the books actually being through hard situations because of how they look, that’s why is so important for this characters to keep it through. Like Cassie said is important in Maia’s case bc she explains how she couldn’t find color dolls when she was a kids, and Magnus skin color, form of his eyes and the cat like eyes has had a big impact in his life….what matters is not where the actor is from, China, Indonesia, Japan etc etc, what matters is that he looked like he was described in the books and the way he played the role…. I don’t think it matters if Alec is white or not I mean in the movie Jocelyn was a redhead, valentine had black hair and jace blond? I mean come on. Who cares as long as they make a successful series. I for once want them to also make the infernal devices I love that series so people need to stop complaining and hope this turns into a successful series. Yaii exited can’t wait to know who else is cast.. Honestly, the fandom needs to chill. I mean Cassie never specified whether Isabelle or Simon was “white” or not. Like race doesn’t matter. Just because your assumption wasn’t right, doesn’t mean you can go hating on everyone. I mean we all want the show to succeed. The only thing about the actors/actresses that we should focus on is their acting, not their race. As a hispanic person myself I am a little questionable. I am worried the only reason they cast Simon and Isabelle as hispanic was to somehow appeal to ethnic people by diversafying the cast. If they had turned Maia white I would think the same way. I am willing to give this a chance because they have a good look, but with the post attched to this I am worried. The last thing I want is for ethnic characters to be created for some kind of go to or scapegoat by trying to gain ethnic support. I loved Isabelle and Simon white and I know there are other people who think the same, but making them hispanic does not make me more hopefull for the show, it just scares me into thinking it will be like that new Annie movie where they tried to gain support with black characters. Again I will give the show a chance, but this new casting makes me a little uneasy. Although I am 100% supportive of the actors, I am also sure the TV producers did indeed choose a diverse cast to appeal to a diverse audience. Why wouldn’t they? It’s a common and sensible business decision – shows with diverse casts get higher ratings. However, I don’t think this is a bad thing or something to be anxious about. I think it’s great that the TV producers are trying to appeal to a broad audience and make the TV show different from the movie. Most US TV shows have SOME diversity in their casts – shows that don’t include diversity are often criticized. The producers are simply keeping Shadowhunters in line with what is already on air. Simon and Isabelle are central characters so I don’t think there’s any reason to worry about tokenism. Also, the character description used to cast Isabelle described her as “exotic-looking.” That is casting code for “not white.” My guess is that the producers intended to cast an ethnic actress to play Isabelle all along, and purposefully included “exotic-looking” to attract ethnic actresses. It all seems very planned and intentional to me. I hear what you’re saying. The issue certainly is quite complicated. But you have to at least admit the books are vague about many of the characters’ ethnicity. Isabelle is described as having pale skin and black hair which could mean just about anything – I have plenty of Korean and Japanese friends who I would describe as having pale skin and black hair. The TV producers seem to be using “colorblind casting” only for the the ethnically unspecified characters while casting appropriate actors for characters whose race/ethnicity is specified. The issue, as Cassie has already pointed out, is that only the racial minority characters have their ethnicity specified because we live in a culture where characters are “assumed white” unless specified otherwise. If the books had specifically mentioned that Isabelle’s ancestry was Irish or Swedish or whatever then I can see why this casting would be problematic. But they don’t. Isabelle’s ancestry could be anything. So I don’t think it’s evidence of the TV producers deliberately straying from the books – I think they have conceded they need to work within the parameters of the books but also want to take advantage of every ambiguity included in the books. We just have to accept that the books aren’t as specific about characters’ ethnicity as we assumed. Pale literaty meand of little pigment, look it up in the dictionary, so people aren’t so much making the assumption that Isabelle and Alec are white as that it literatery means white. You can be pale in comparison to others ofr you ethinicity but the word pale means whiter than the average white person. Where for Jace and Clary this wasn;t mentioned and therefore they could be of every ethnicity know to mankind, Isabelle and Alec’s skincolour was mentioned and does belong to an ethnicities. So it really was in the books. It’s also in Cassandrajp’s arts work which is all approved by Cassandra Clare. It doesn’t really matter either way, but people their image of a white isabelle is more accurate than any other image of isabelle if you want to stay close to the books description. That the writers went with the best actress (and lets hope they really did) then she doesn’t have the same ethinicity as Isabelle. I do think having more diversity and therefore casting more different enthicity was a marketing plan, abc is known for its diversity and a divers cast appeals to more people. European fans don’t count as a mark that needs to be pleased so from a business point of view, and stricly business, casting latin actors improves your odds for a success full show. Since North America and Midden America are the market. I’m fine with the casting, but I’m trying to get people to understand why not everyone is thrilled about it and why maybe certain choice were made. You have misunderstood me. Cassie also openly admitted she “never specified” Isabelle’s ethnicity and that she “never thought about it — which is a function of my own privilege and something I’m working on.” I agree with you that Cassie intended Isabelle to come across as white in the books BUT when you actually look for specific details of Isabelle’s specific ethnicity there are only vague details like “pale” skin which is open to interpretation. As you wrote, pale often means in comparison to others. All I’m saying is that this isn’t technically an example of the TV producers contradicting the books – instead they are taking advantage of places where the books don’t specify. To me it’s roughly equivalent of when the filmmakers gave Clary a darker shade of red hair than the cover illustrations depicted. I am Mexican-American Atocha makes me Hispanic. Honestly I am so glad that these two wonderful actors got cast. Emeraude was in Nuestra Belleza Latina which is a beauty contest for Hispanic women so I know she can portray Izzy’s beauty and power wonderfully. Alberto seems so geeky just like the Simon Lewis we know and can’t wait to see him act the part! Les mando muchos besos a estos par de actor y actriz. Los felicitó por a ver recibido estas partes y les deseo buena suerte a los dos con este nuevo proyecto! I am 70 years old and was raised in a Southern state where I had the “pleasure” in the 1950s of seeing American citizens with skins darker than mine being blasted with firehoses and set upon by police dogs on my family’s grainy black and white TV. They wanted access to basic amenities like water fountains, lunch counters, and restrooms. My father cheered. I moved away from home. It saddens me that ethnicity has been raised as an issue here at all. I looked at the chosen actors and thought “cute and beautiful.” They will be perfect for their roles. Yeah, acting is the most important thing! And same boat with you about Magnus, and the rest of the characters for that matter. I agree. If they can do the part and act it, it will be fine. Who are they going to release next? Magnus I am very worried about, he is the character that they will most likely mess up, him or Alec. Only time can tell. I don’t mind this at all. We should all be thankful that at least we’re getting characters casted. And hopefully they play the parts well and really bring the characters to life. And to whomever gets casted for the rest of the characters, whoever they are, let’s just treat them fairly. The idea that their being Hispanic is a problem is the silliest thing ever. They both look the part, which is always nice since the most important aspect is how well they play the character. The guy playing Simon looks especially perfect to me. I agree with the poster who said they do need to at least remember that Alec and Izzy are siblings, so now I actually hope they cast someone with similar background as Emeraude. Can’t wait for the Clary casting though!